Sea snakes as the name suggest, spend their entire life in the ocean. Researchers have always been curious to know how do these snakes survive in seawater and what method did they employ to satisfy the quench for fresh water. According to a latest research, the sea snakes though surrounded by water, unfortunately, remains thirsty and dehydrated for months. Sea animals like turtles, marine iguanas, penguins and sea birds have exclusive glands for removing excess water from their body. Others avoid seawater and depend on the food they eat for satisfying the need for fresh water. Sea snakes also had such glands beneath their tongue that are believed to be helping these snakes to excrete excess salt from their body. But researchers upon closely studying these snakes found that the salt excreting glands could remove salt taken up while eating or from the fish they feed and are not at all apt for removing large quantities of salt that they would accumulate in their body if they drank sea water. This raises the question, how do they sea snakes cope up with their quench for fresh water in an aquatic desert? A research team studies yellow bellied sea snakes that are completely marine. They studied the population of sea snakes (Hydrophis platurus) found near Costa Rica which remains devoid of rainfall for nearly seven months in a year. Studying several of these snakes revealed that they never had drunk seawater. 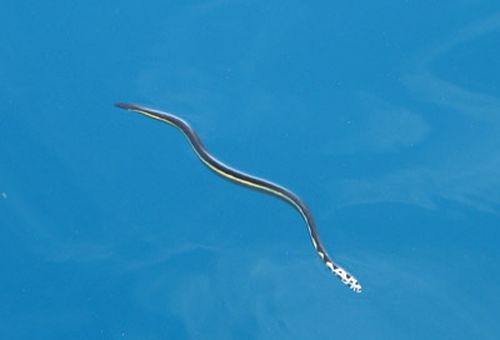 They discovered that the sea snakes rely on rainfall for fulfilling their requirement for fresh water. When it rains, the fresh water does not completely mixes with the seawater and instead forms a thin film of fresh water above the heavier salt water. This film is known as lenses and are either sweet or less salty, enough to be drunk by sea snakes. These sea snakes drink from such sources of fresh water because they regularly come to sea surface for breathing. They can also sense the area with the likelihood of rainfall by gauging the variation in the pressure that follows a storm. Researchers further studied these serpents to see whether they dehydrate during the dry season, in the absence of fresh water to drink. Therefore, the research team in both dry and wet seasons, collected some 500 yellow bellied sea snakes. These snakes were measured both before and after they were provided with fresh water to drink. These figures helped researchers to estimate the fat and muscle content of snakes. And 40 snakes were killed to analyze their body water and were weighted before and after drying them completely in an oven. Half of the snakes captured during the dry seasons drank fresh water when offered while the one collected during the wet season, almost none opted to drink the fresh water offered. They observed that the snakes’ body conditions directly relates to amount of water the snake drinks. The snake light in weight tends to drink more. They also noticed that the snakes seized during the dry season had lower body water content than the one captured during the rainy season. The researchers conclude that the yellow bellied sea snakes are very well adapted to survive extreme dehydration and can go without fresh water for up to six or seven months at a stretch. The body water content of these snakes is very high as much as 80 percent. While the other animals, such as snakes living in fresh water had approximately 70 percent of water content and sea turtles have 65 percent of water content. 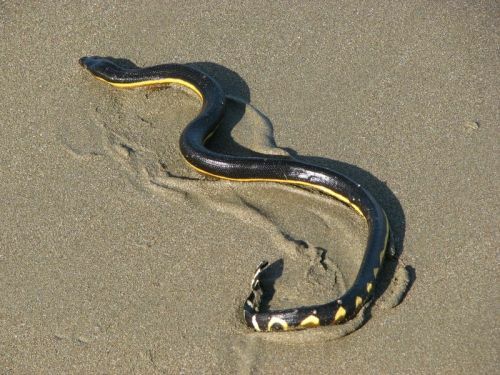 The high water content stored by yellow bellied sea snakes might be a possible reason which helps them to cope up during the long dry season. But this also indicates that in the drought conditions can take a toll on these snakes. Many species of snakes, which were found in abundance along the coast of Northern Australia, have disappeared over the time following long drought season. The irony of these snakes is that even when surrounded by water they suffer dehydration and die of thirst.